The home is the centerpiece of any residential property. You can have the best landscaping and the cleanest concrete on the block but if the siding and exterior surfaces of your home are covered in grime, mildew, or algae then the curb appeal of your entire property suffers. 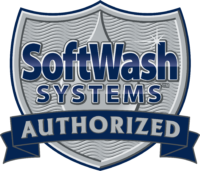 Our soft wash house washing service is the safest and most effective way to completely clean your home and restore its curb appeal. Plus, our cleansers are environmentally friendly, meaning that your landscaping won’t be harmed in the process. The roof is usually the largest single surface on any residential property. So it makes sense that when it looks dirty, well, so does your entire home! Many homes in Tyler, TX suffer from black streaks on their roof. This bacteria not only looks bad, but degrades the shingles themselves, eventually leading to roof leaks and possibly premature roof replacement! Our soft wash roof cleaning eradicates this bacteria and completely cleans your roof without the use of high pressures that can directly lead to shingle damage. If your home is the picture then your concrete areas are the frame within which it sits. Don’t let your home be framed in dirt! Using state of the art cleaning technology, our power washing crews can remove years of dirt, grime, and organic buildup that turn bright and clean concrete into dirty and drab eyesores. After our power washing service, your concrete areas will look new again! The windows around your home capture and reflect light, so when they are dirty it is plainly visible to all. Rain, dirt, dust, and even animal droppings can contribute to making your windows look nasty. Using the same careful attention as we do for all of our exterior cleaning services, our window cleaning service removes even the toughest, sunbaked dirt, allowing your windows to dry to a streak-free and brilliant shine! It is our privilege to help homeowners in Tyler enjoy clean and vibrant home exteriors. By offering a full suite of exterior cleaning services you can rest assured that whatever surface you have that needs cleaning, we can do it! We are committed to delivering exceptional quality and superior service to each and every customer we visit. Now is a great time to have your entire property cleaned from roof to driveway! Give our professional power washing team a call or click the button below to request your free quote!